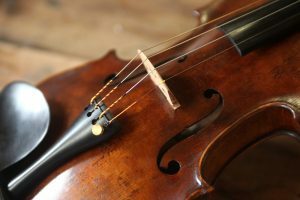 While setting up a violin, viola, or cello well is crucial to it’s playability and sound – tonal adjustments take the tone to the next level. Adjustments are made such as; further fine tuning the placement of the soundpost, carving and/or thinning the bridge more, choosing different strings, changing the tailpiece, and maybe even mode matching! Mode matching is a process that takes years of dedicated practice for a luthier to achieve competency in. Basically it is the process of matching the tap frequency of the wooden body of the instrument (sort of like when one taps a xylophone key) to the resonating pitch of the air chamber inside the body (think of blowing into the top of a soda bottle). While it’s probably hard to imagine exactly what that entails, when done well it can often yield big results such as more overall volume, better response, and increased tonal characteristics. As much as what is done to achieve better tone is important, tonal adjustments are essentially pointless if the luthier is not a sensitive listener. He should be able to not only discern minute changes in the sound of the instrument, he should – even more importantly – be able to listen to the needs of the musician and interpret what the musician is saying in order to translate those needs into the appropriate adjustments. With all the skills a competent luthier needs, it is easy to forget how important listening really is. Truly, it is just as critical a skill to the luthier as it is to the musician.